During the Civil War general officers and various categories of staff officer wore a U.S. in a wreath on their headgear. A smaller version was worn on the front of the forage cap (kepi). A larger was intended for the Jeff Davis hat, but also might be used on the forage cap. This insignia was originally worn on the 1839 forage cap by generals and staff officers and later on the 1851 cap or shako. In 1858 the Jeff Davis Hat replaced the 1851 cap and the U.S. wreath was transferred to the Jeff Davis Hat. The U.S. wreath remained in use until 1895 when an eagle became the cap insignia for all officers. 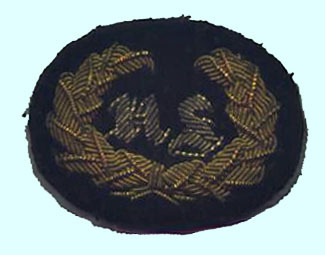 Since officer's uniforms were private purchase and the insignia made by hand individual officers sometimes modified regulation insignia. On occasion the letters of s staff officer's department appeared rather than U.S. but this was never regulation. For example, a member of the medical staff might wear "M.S." General officers occasionally wore a star or stars or a star in addition to the U.S. Other insignia worn by state militia officers had the initials of the states in place of U.S. The Old English letters U.S. are embroidered in silver bullion and the leaves in gold on a dark blue velvet field. An oval border of Jaceron wire might surround the design, particularly the larger ones intended for the hat. A metallic U.S. wreath was worn by hospital stewards.